DAY 1: Rome, Italy’s capital, is a sprawling city with nearly 3,000 years of important art, architecture and culture on display. 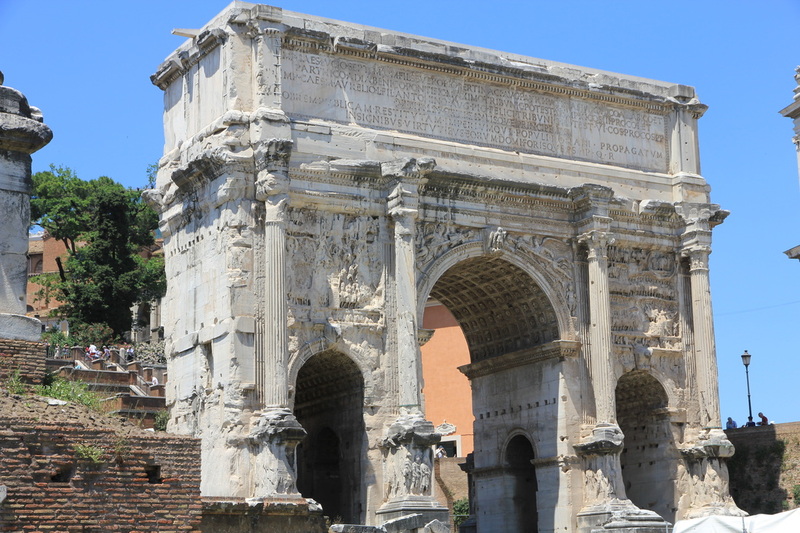 This week we will look at five of the most important historical architectural features found today in Rome. 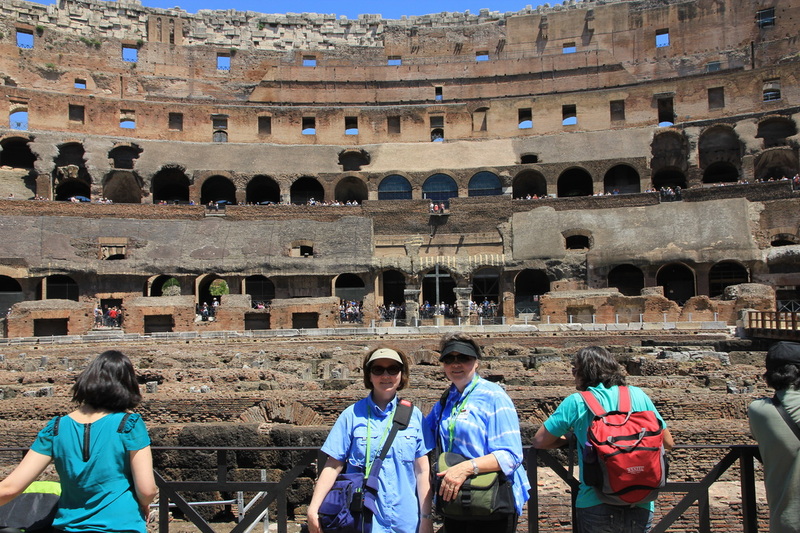 By the way, all the photographs this week (except the recreation images) were taken by Miss Hesse this summer when she and Miss Hurdle spent four days in Rome. 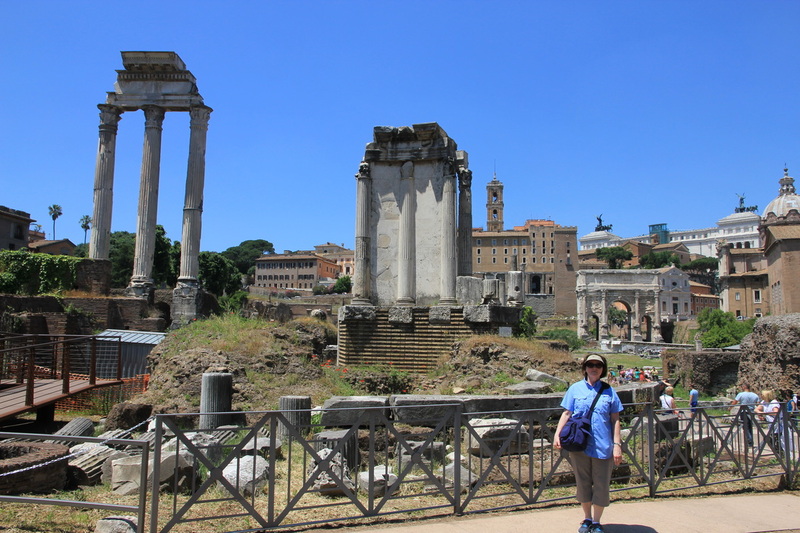 The Forum - The Forum was one of the important centers of Roman daily life --today you can see the remains of the Forum. It is hard to believe that they are over 2000 years old! 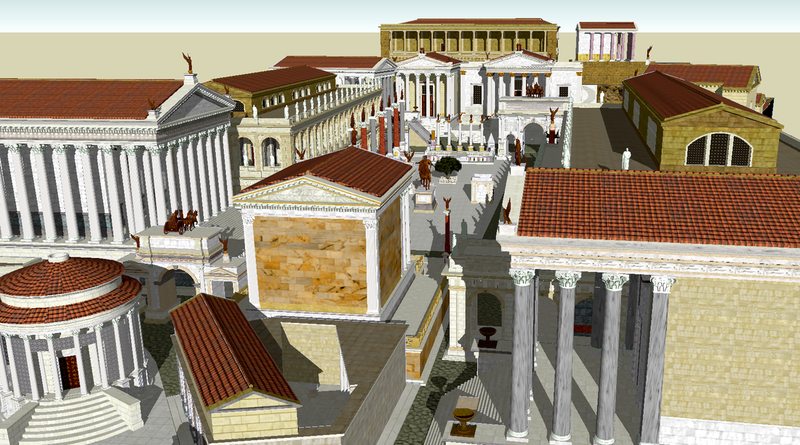 The Forum was a big open area, ringed by Roman banks, temples, baths, and businesses. The center open area held the marketplace. 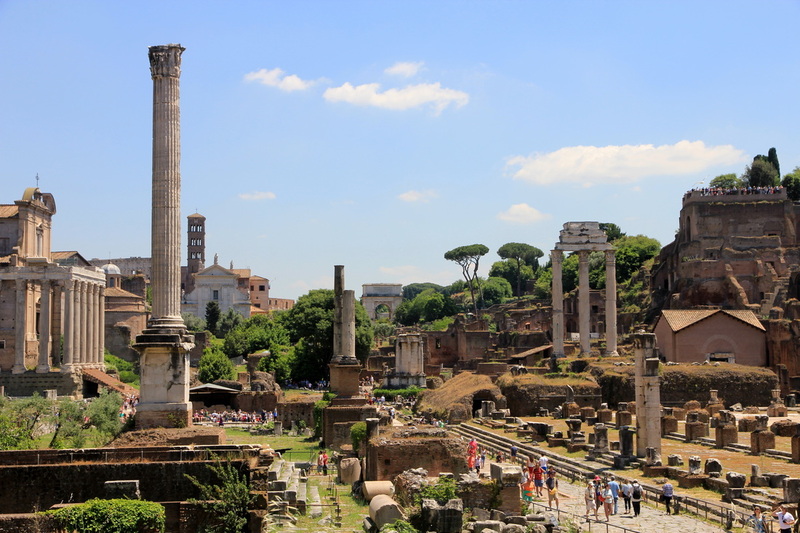 Roman adults might wander down to the Forum to do their shopping and banking, trading and marketing. But the Forum had another purpose that we might find unusual. It was in the Forum where anyone who felt like it could stand and talk to the crowd and express their views on any subject. This was called Orating and the Romans loved it. 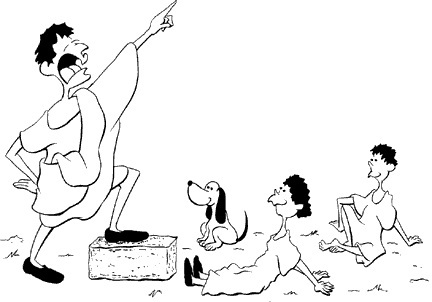 Teachers of speech-making would bring their students to the forum and assign them to try and convince the crowd that a specific idea was the correct and proper idea. Politicians gave speeches here. Any adult male Roman citizen could speak in the Forum. The ancient Romans were great orators. The job of their orators was not to argue, but to argue persuasively! People thronging the Forum would stop and listen to anyone Orating, then wander away to do their shopping, and perhaps leave a gift at a temple for one of their gods. 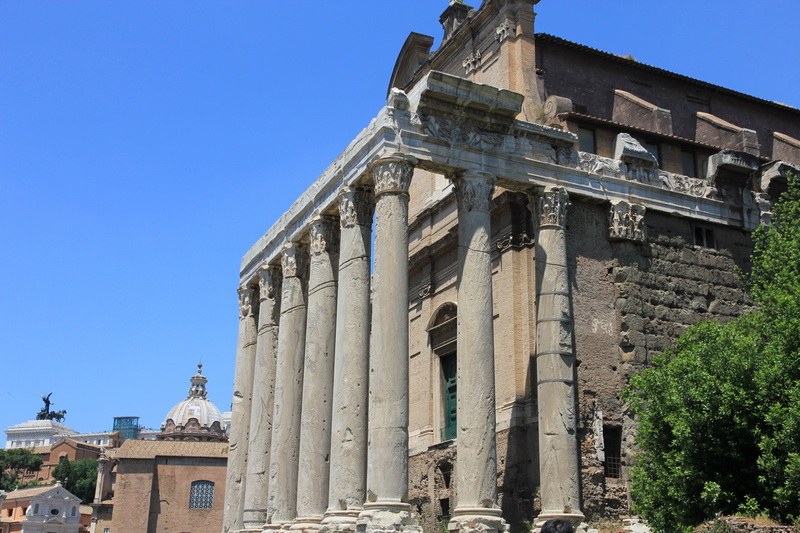 The Forum was also used for festivals and religious ceremonies. It was a very busy place. 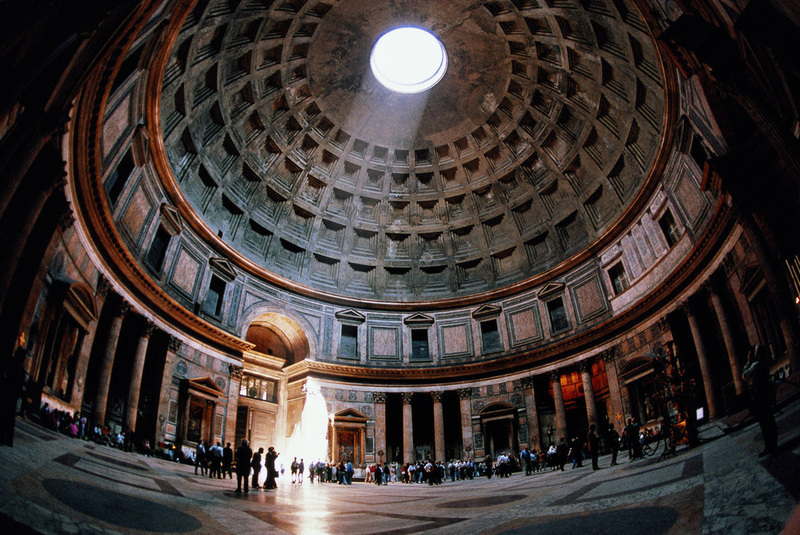 DAY 2: Pantheon - ​The Pantheon is a building in Rome which was built as a temple of all the gods of ancient Rome. Pantheon in Latin means “temple of all gods”. 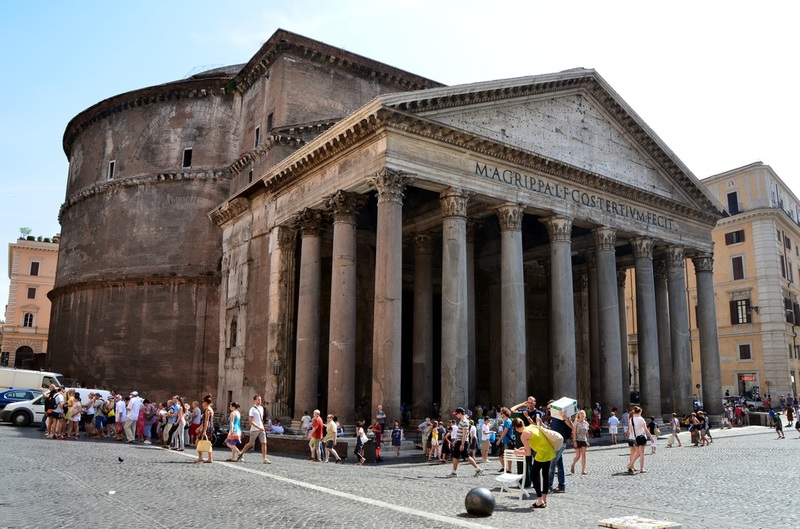 The Pantheon is the best preserved building of all the roman ruins and it has been continually in use since the 2nd century AD. Oh! Before we go on... it's important to know that once, this building was covered in white marble. The marble was taken from the Pantheon and used to build churches after Constantine declared Christianity the official religion of Rome. 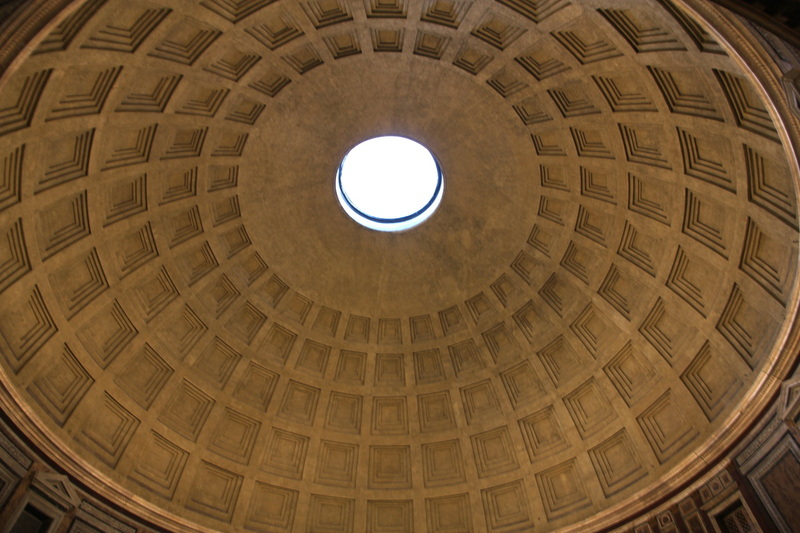 The Pantheon holds the record for the largest non-reinforced dome in the history of architecture. Although it was originally built as a roman temple, it was later converted to a Catholic Church. 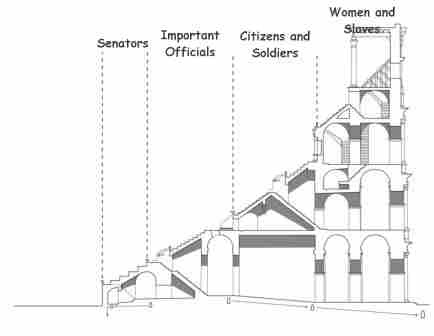 The most important problem faced by Romans during its construction was the massive weight of the large dome. The huge columns of Pantheon were brought from Egypt. Each weighed 60 tons. 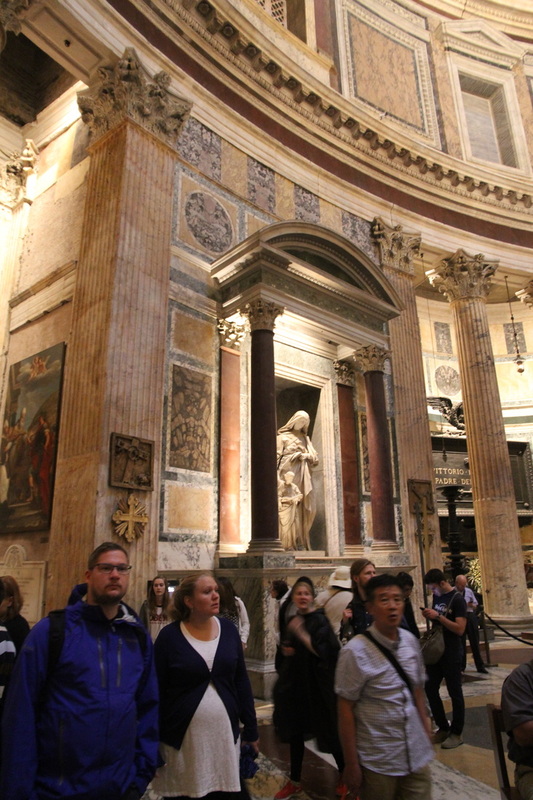 The Pantheon contains the tombs of one of our Artists of the Week, Raphael, and also has the tombs of several kings of Italy. 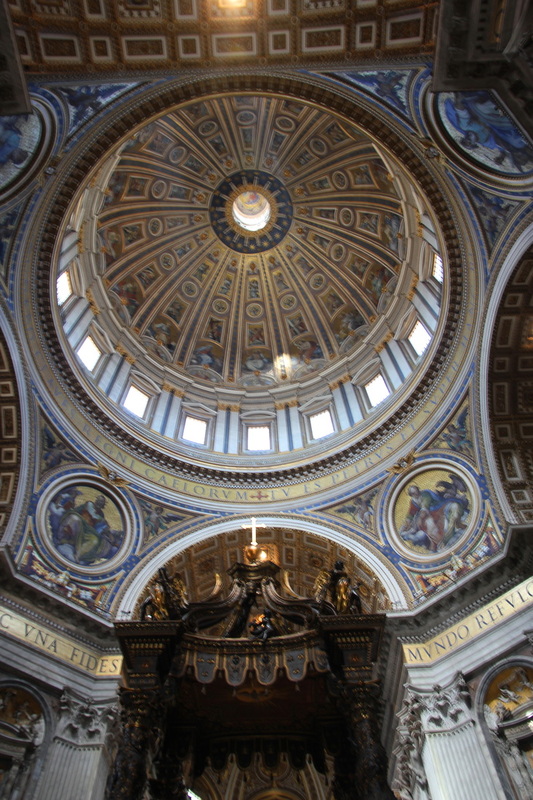 When you look up at the top of the dome you will notice a central opening (oculus), the Great Eye, open to the sky. There is nothing covering that opening. 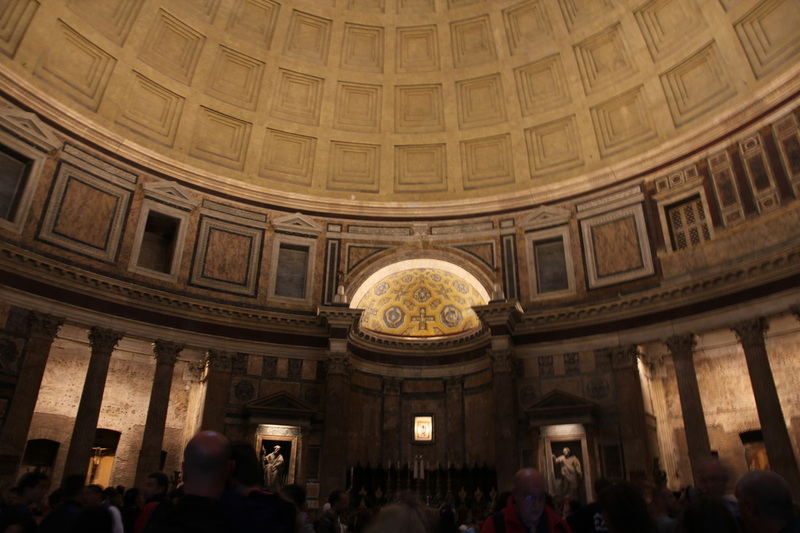 When it rains or snows, it rains and snows inside the Pantheon! 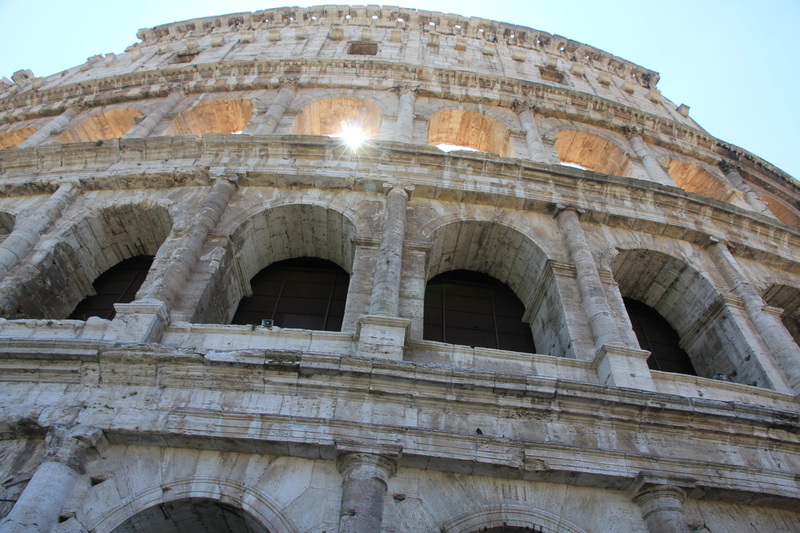 DAY 3: The Coliseum - The Colosseum is a giant amphitheatre in the center of Rome. 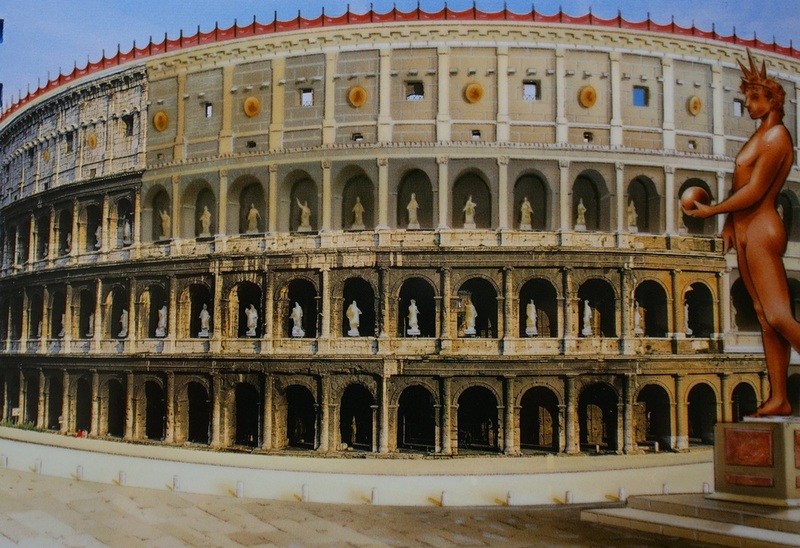 The first ever games at the Colosseum lasted for 100 days and included more than 3,000 gladiator fights. Construction on the Colosseum was started in 72 AD by the emperor Vespasian. It was finished eight years later in 80 AD. The Colosseum was huge. It could seat 50,000 people. The Colosseum covers around 6 acres of land. 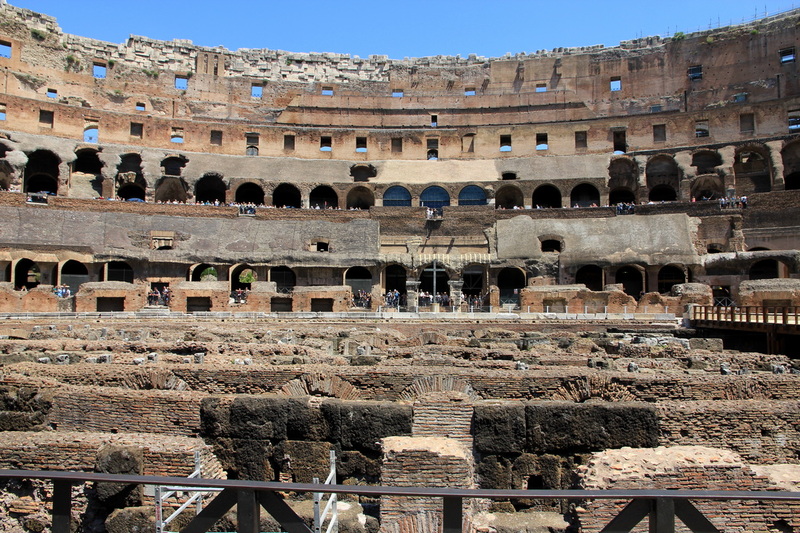 Where people sat in the Colosseum was determined by Roman law. The best seats were reserved for the Senators. Behind them were the ranking government officials. A bit higher up sat the ordinary Roman citizens (men) and the soldiers. Finally, at the top of the stadium sat the slaves and the women. The best seat in the house belonged to the emperor who sat in the Emperor's Box. Of course, a lot of times it was the emperor who was paying for the games. This was one way for the emperor to make the people happy and to keep them liking him. 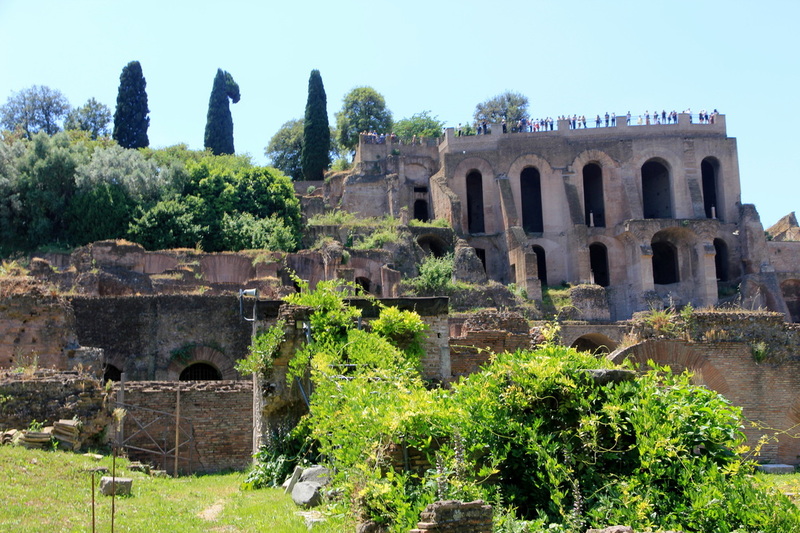 Below the Colosseum was a labyrinth of underground passages. 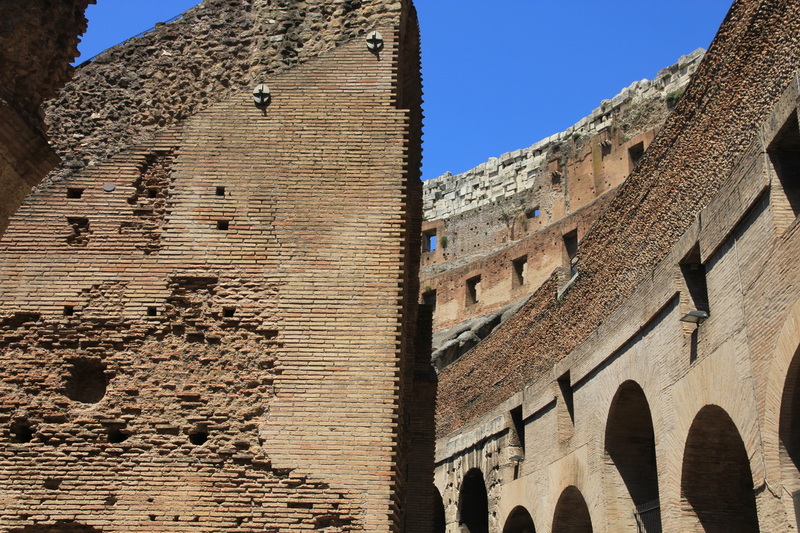 These passages allowed for animals, actors, and gladiators to suddenly appear in the middle of the arena. They would use trap doors to add in special effects such as scenery. The walls of the Colosseum were built with stone. They made use of a number of arches in order to keep the weight down, but yet still keep them strong. There were four different levels that could be accessed by stairs. Who could enter each level was carefully controlled. 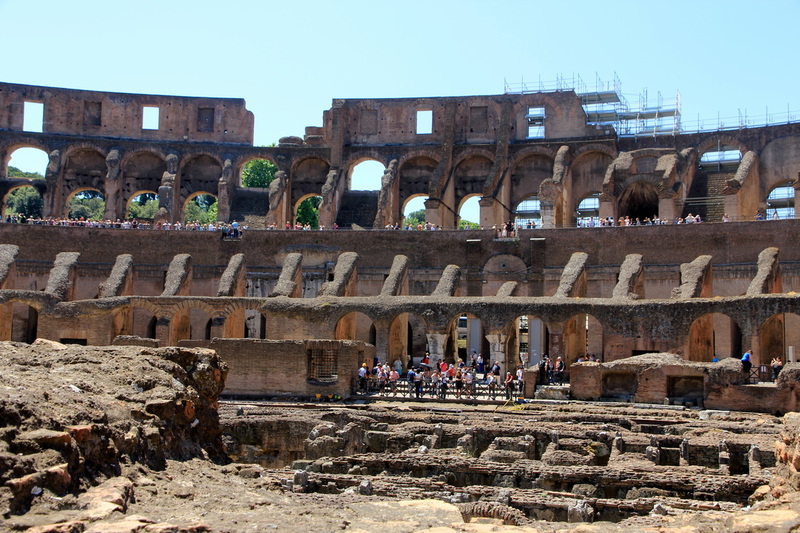 The floor of the Colosseum was wooden and covered with sand. There were 32 different trap doors underneath the floor of the stadium. To keep the hot sun and the rain off of spectators, there was a retractable awning called the velarium. There were 240 wooden masts around the top of the stadium to support the awning. 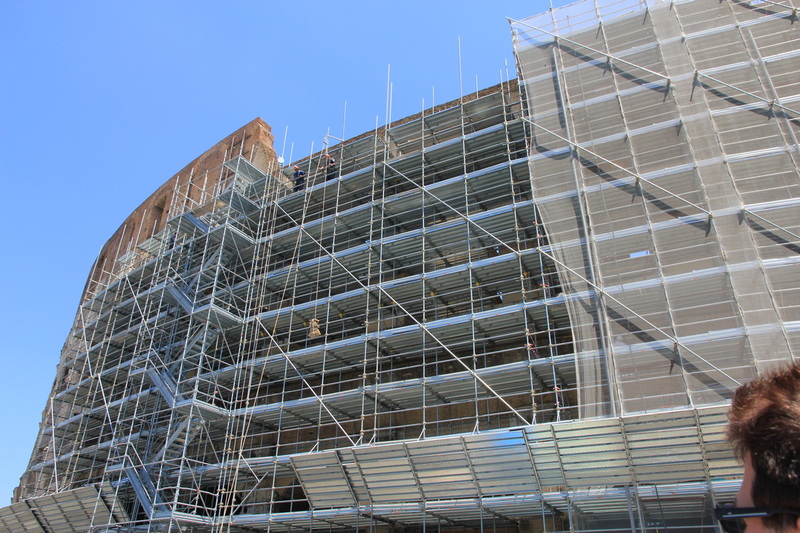 Roman sailors were used to put up the velarium when it was needed. The Colosseum had 76 entrances and exits. This was to help the thousands of people to exit the arena in case of a fire or other emergency. 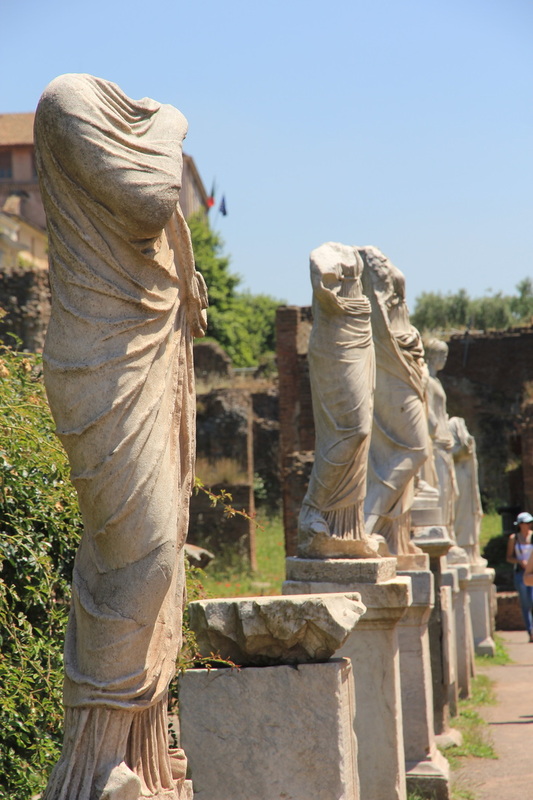 The passages to the seating areas were called vomitoria. The public entrances were each numbered and spectators had a ticket that said where they were supposed to enter. 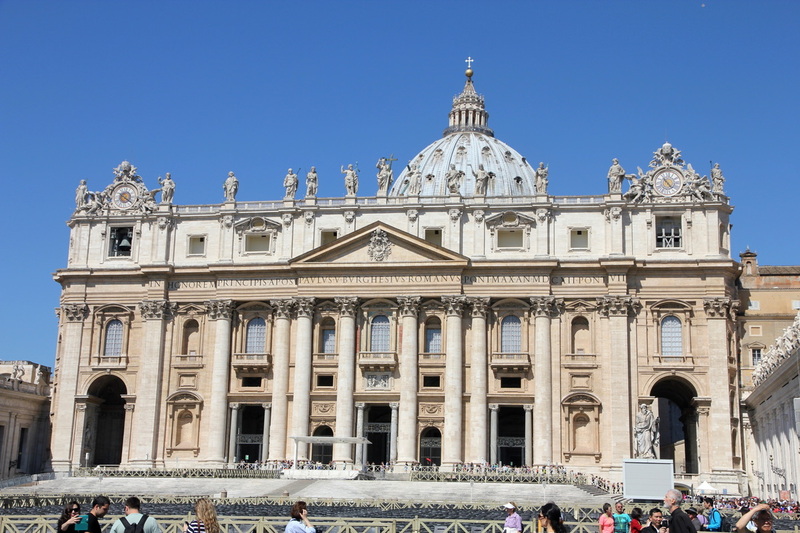 ​Day 4: The Vatican - is a separate country that is inside the city of Rome, Italy. There is a wall around the city, but there is a huge boulevard that is open, freely connecting Rome with the Vatican. It is really hard to tell you are not still in Rome. The Vatican is owned and governed by the Catholic Church with the Pope (remember Pope Francis?) having supreme power over all aspects of the government. 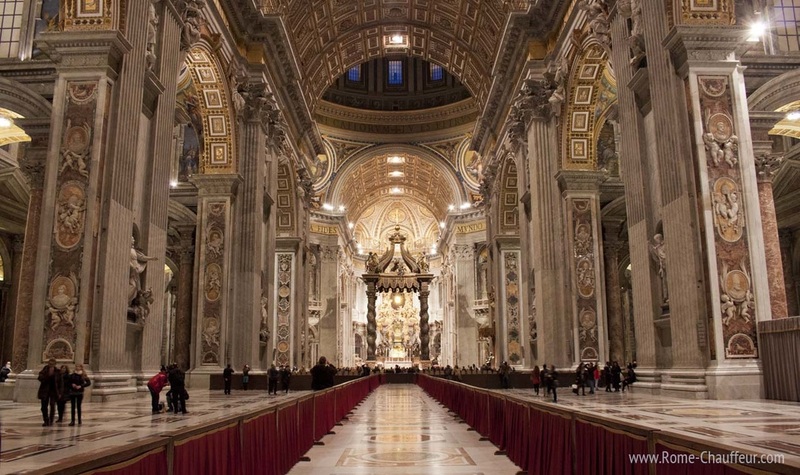 St. Peter's Basilica is the largest Christian church in the world. St. Peter’s Square: is a massive plaza located directly in front of St. Peter's Basilica in the Vatican City. Crowds gather here to hear the Pope speak. 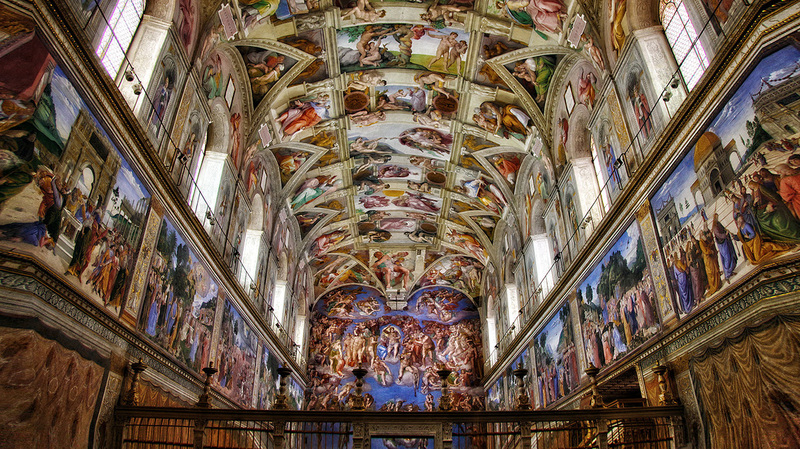 Michelangelo’s paintings on the ceiling of the Sistine Chapel are found at the Vatican. 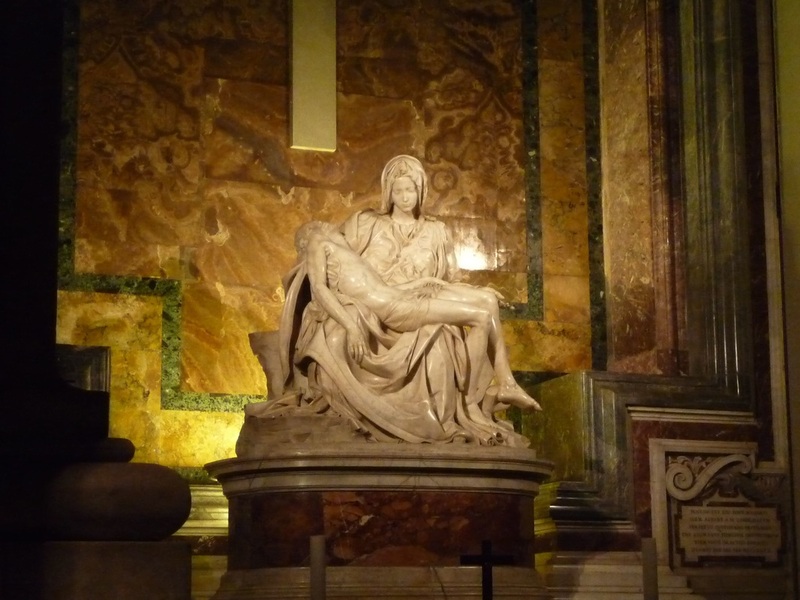 It is also here, inside St. Peter's, that you can see Michelangelo's, Pieta. 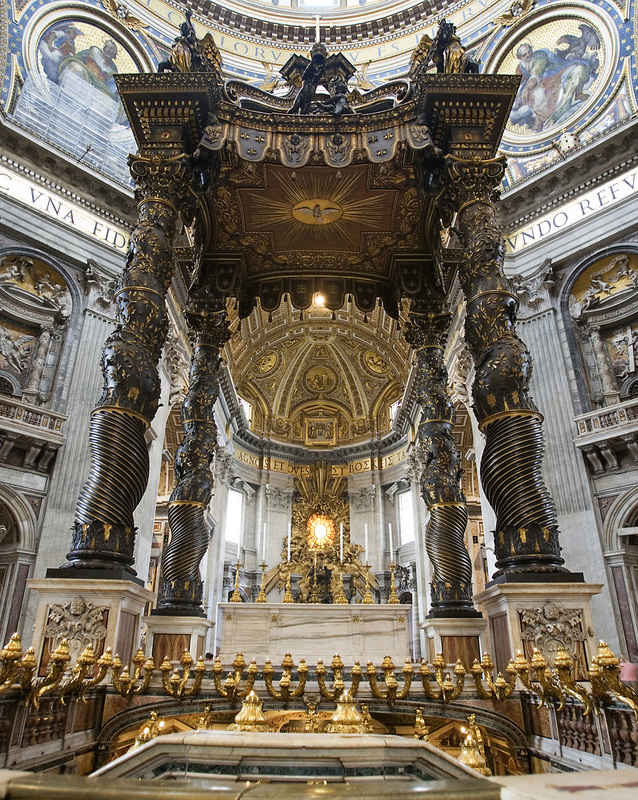 Bernini's Pala Altar - MASSIVE! 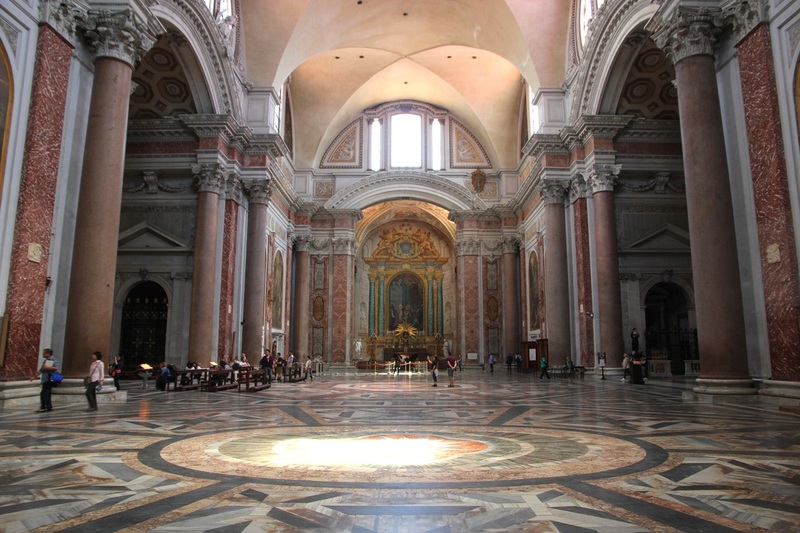 DAY 5: The Basilicas of Rome - There are over 1000 churches in Rome. 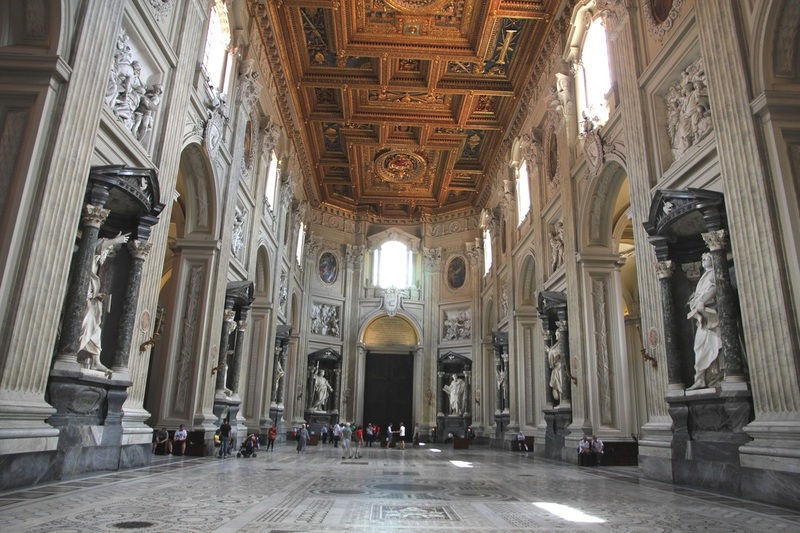 Some are called Basilicas --that means a saint or important person in the church is buried there. 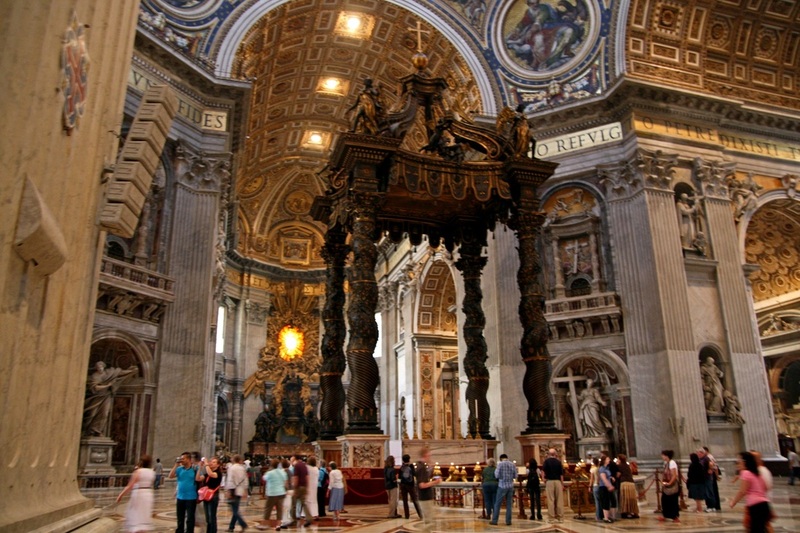 For instance, Peter is buried at St. Peter's Basilica --hence the name. There are churches called "duomo" -- Italian for cathedral. That means it is the home of a Cardinal (which is a high office in the Catholic Church) or a bishop (still important, but not as high an office as a Cardinal). There are 115 Cardinals in Rome, and each has his own church. Then there are regular churched called chiesa (key-A-zuh). 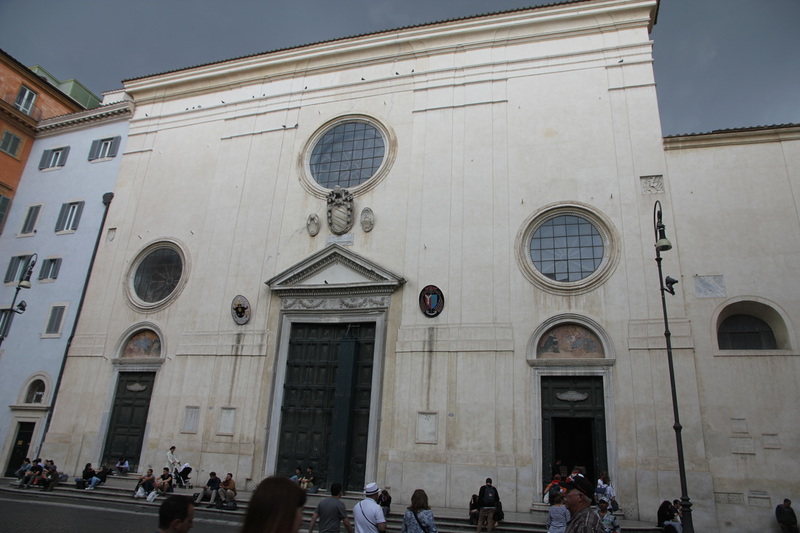 The Pope, also has his own church called San Giovani in Laterno. It is really huge and really beautiful. Miss Hesse and Miss Hurdle visited over 25 of the most famous churches in Rome. 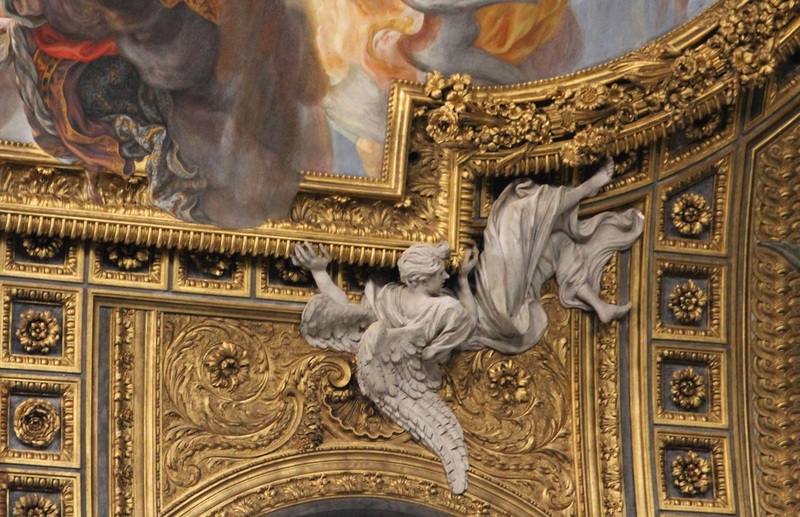 These were built at a time when art was created, not for museums, but as part of the decoration of the church. It was also a time when builders were themselves artists who created amazing structures without all the equipment we see used today. 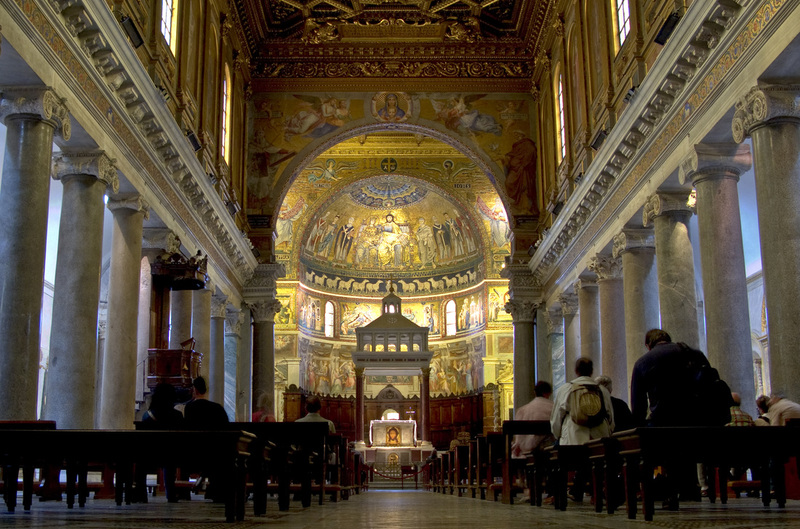 Let's look at some of Rome's amazing churches and see what features are common to most. 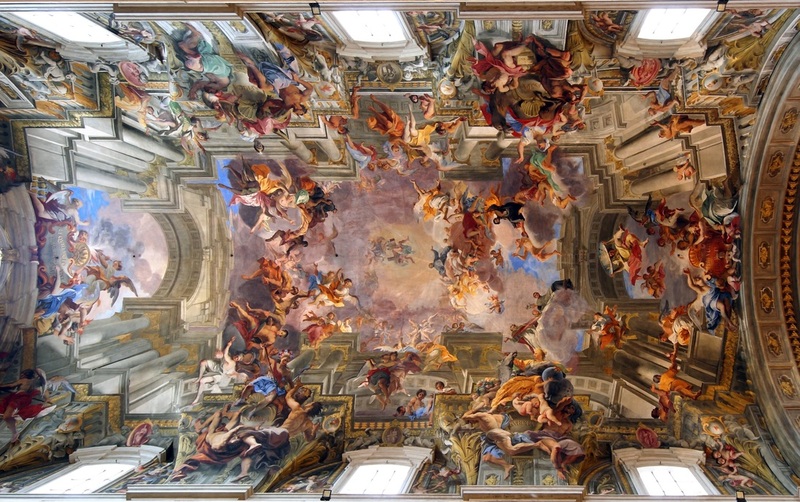 Ignazio di Loyola - trompe l'oeil ceiling (actually a flat ceiling painted to look as if it has a high dome. 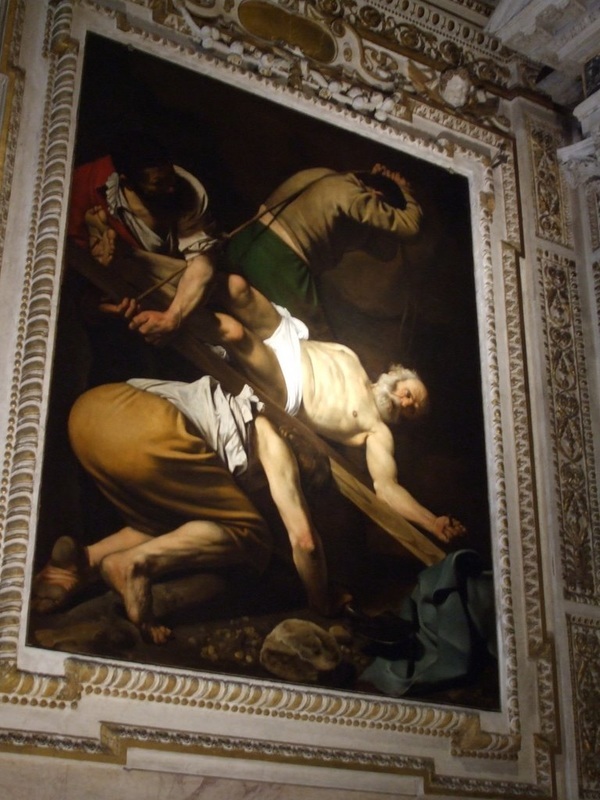 Santa Maria del Popolo - Caravaggio's "Crucifixion of St. Peter." 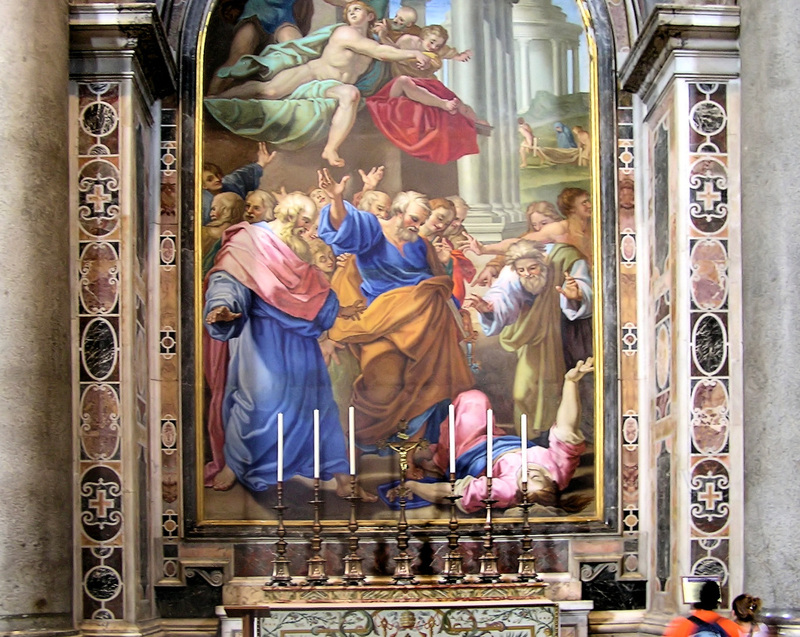 His paintings are in many churches --so close you could touch them! San Giovanni in Laterno - marble statues of the Apostles and others in the Bible. Notice the size of the people compared to the statues! 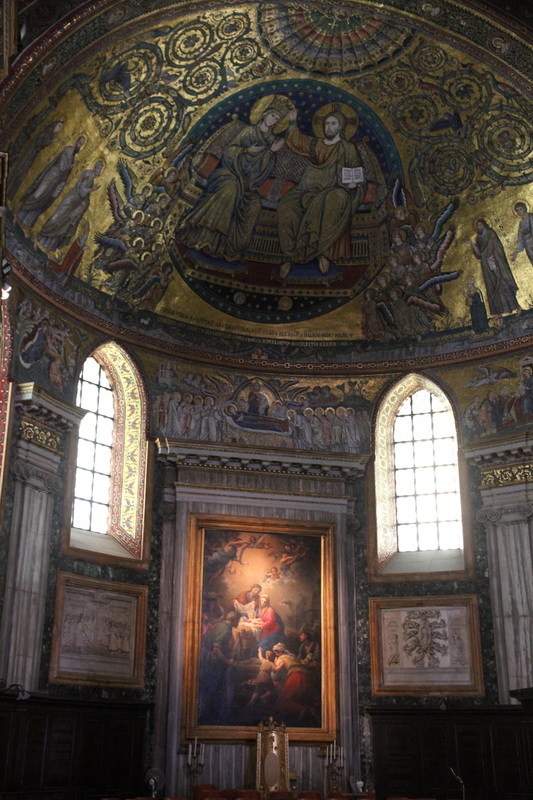 Santa Maria Maggiore - considered one of the most beautiful churches in Rome --it is all about the Nativity! Santa Maria in Aracoeli - SUPER old. Sits at the top of the Forum and is known for its Christmas Eve service of candle-lit chandeliers. 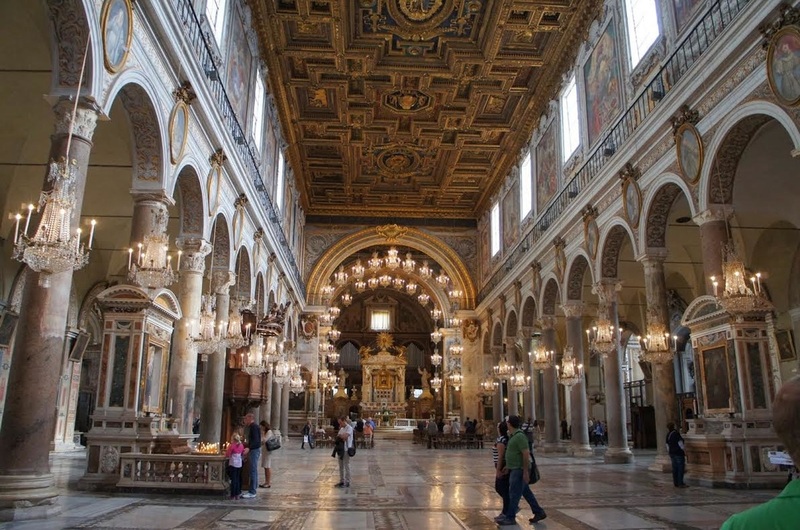 The OUTSIDE of most of the churches in Rome are rather plain --but wait till you step inside! 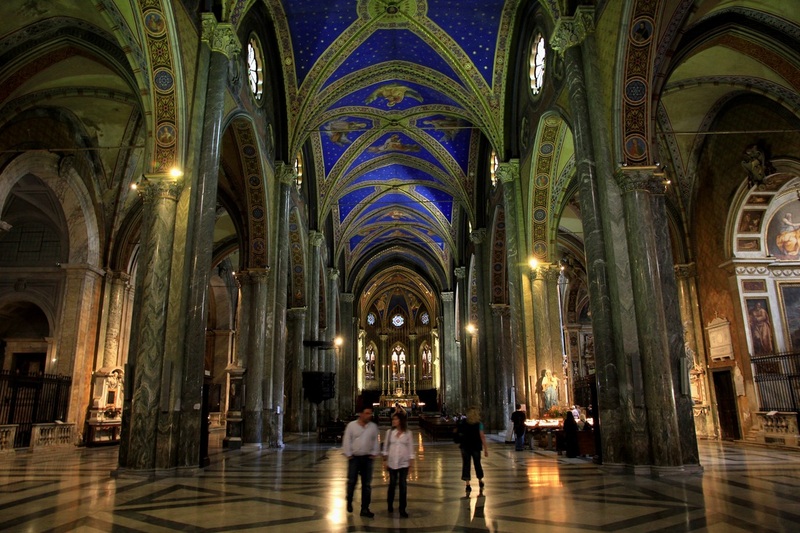 Santa Maria Sopra Minerva - the ONLY Gothic church in Rome. 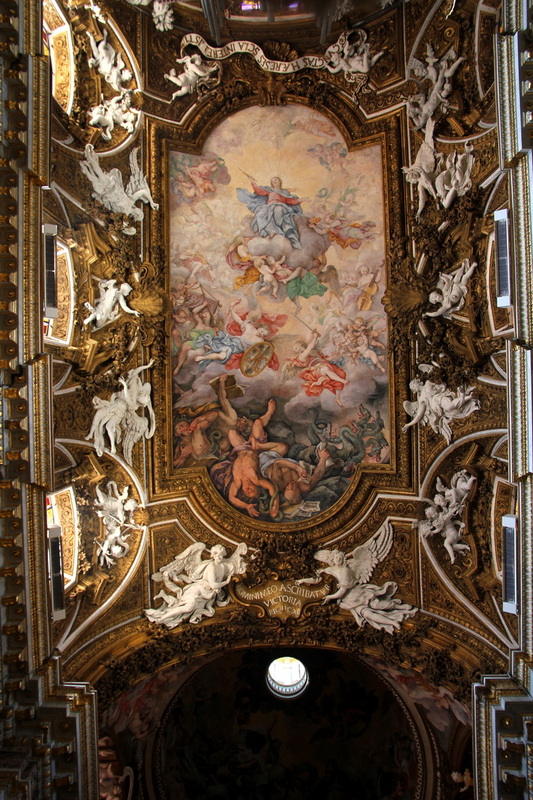 The others are almost all Baroque. 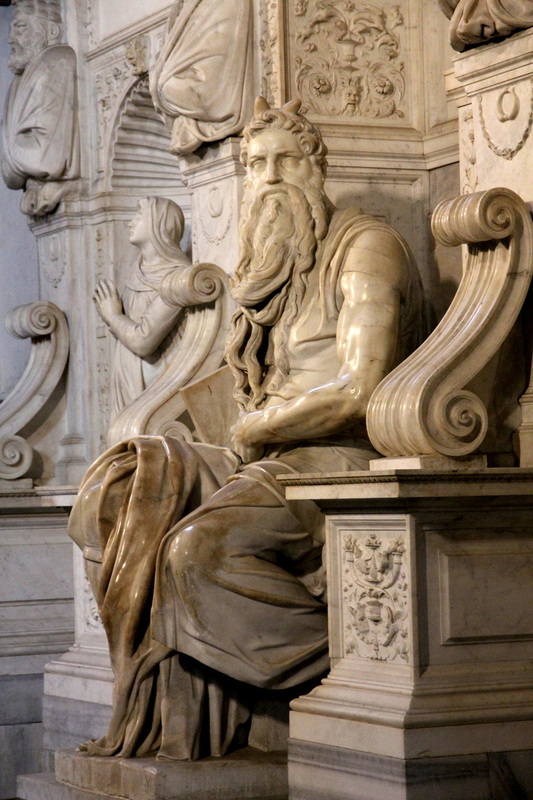 Michelangelo's "MOSES" inside St. Peter in Chains. Michelangelo's sculptures are in many churches. This Moses would be about 10 feet tall if he stood. 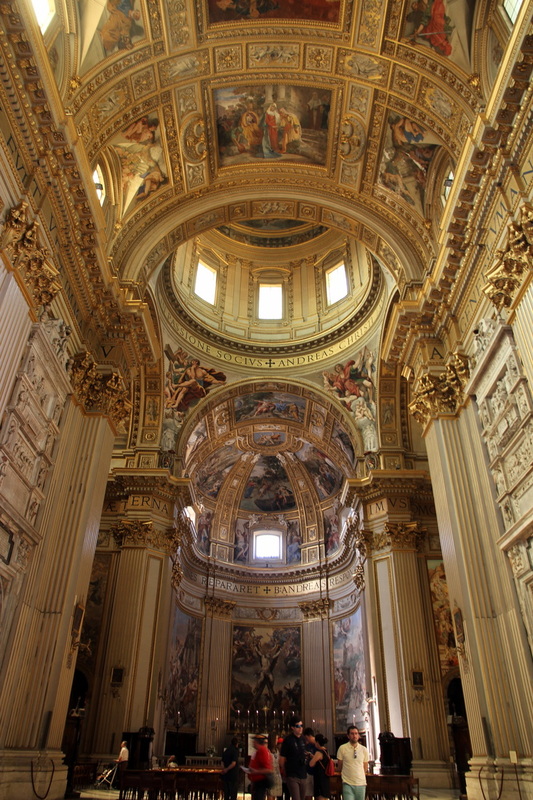 St. Andrea Della Valle - the church of gold and light. 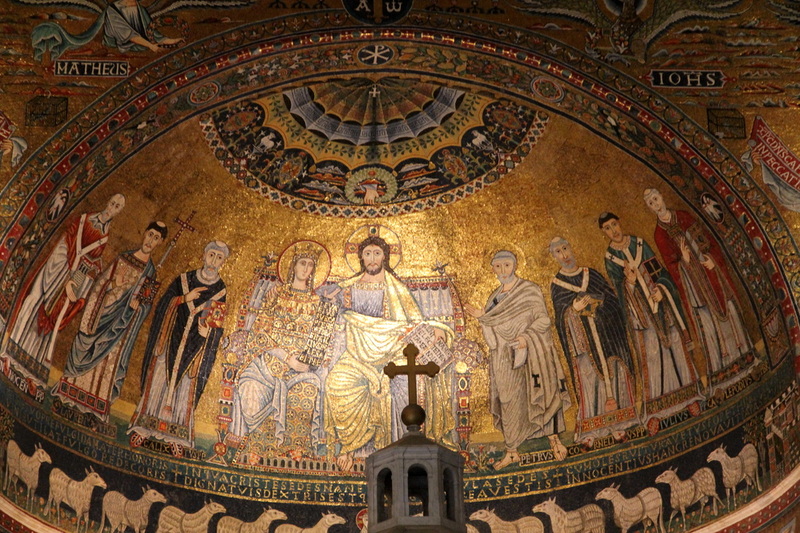 The OLDEST church - Santa Maria in Trastevere was built in the 4th century!